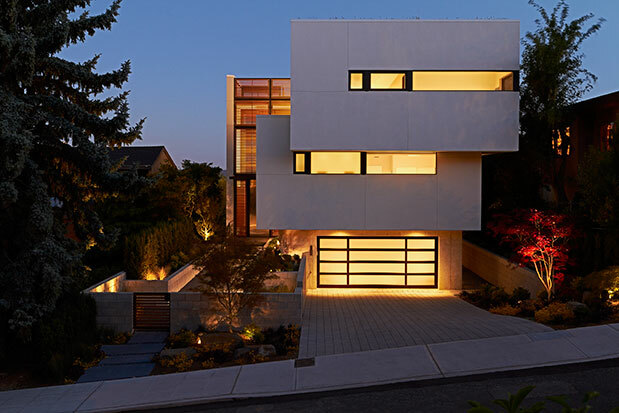 “Can this thing stand up?” Brandon Mullenberg asked when reviewing architect Mark Haizlip’s initial scheme for his and wife Nikola’s new Queen Anne home. Purchased in 2009, the site’s original Tudor-style house had fallen into disrepair, and its hillside location posed inherent limitations and concerns for the new owners. Presented with a total teardown and rebuild, Haizlip’s Alloy Design Group team was up for the challenge, offering an offbeat and seemingly gravity-defying design. “We had to push the boundaries a little bit,” Haizlip says. 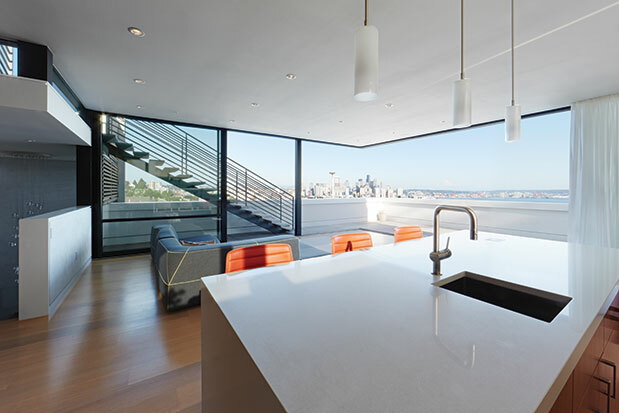 Sliding glass walls in the living room open onto the home’s southern deck, offering sweeping views of the Seattle skyline and extended entertaining outdoors. Guests can relax and recline in the top-floor living room. The Mullenbergs had fallen in love with the site’s panoramic views of downtown Seattle and Puget Sound, and were excited about the possibility of creating a custom home in the modern style they both wanted.The two biggest considerations were privacy and being able to create a flat space where the couple’s growing family—Lukas, 6, Nela, 4 and Zachary, 2—could play. “That desire drove what the house became in the end,” Haizlip says. The Mullenbergs invite friends to join them on the roof when fireworks illuminate the Seattle skyline on New Year’s Eve. Haizlip likens the final design of the more than 4,700-square-foot home to a Jenga tower: four stories (one is underground), with each floor a giant game piece, placed not quite squarely on top of one another. The top floor is designated as the family’s living space, where friends come to watch fireworks light up the Seattle skyline on New Year’s Eve. The dining room table on the home’s top floor. “Rather than enjoy the best views from the master bedroom, we decided that we wanted to be able to have them in our daily lives,” Brandon Mullenberg says. The home’s three lower stories house a total of five bedrooms and five bathrooms, enough space for the children and frequent family guests. 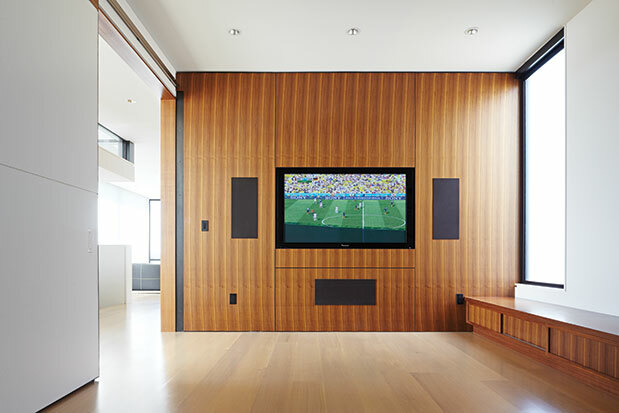 A walnut wall houses the family television in the media room. 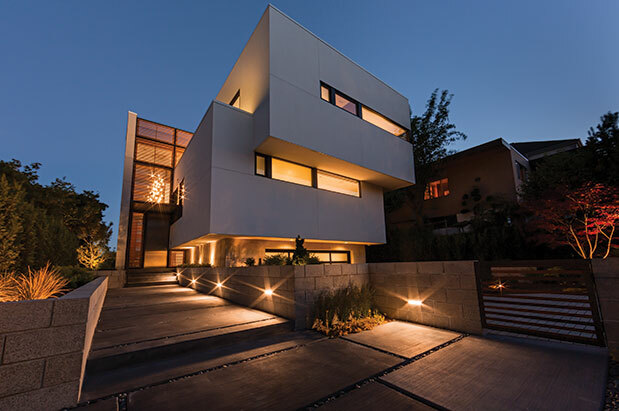 Contending with the full walls of glass on the south side of the home, Haizlip and his team chose innovative options for controlling interior temperatures. 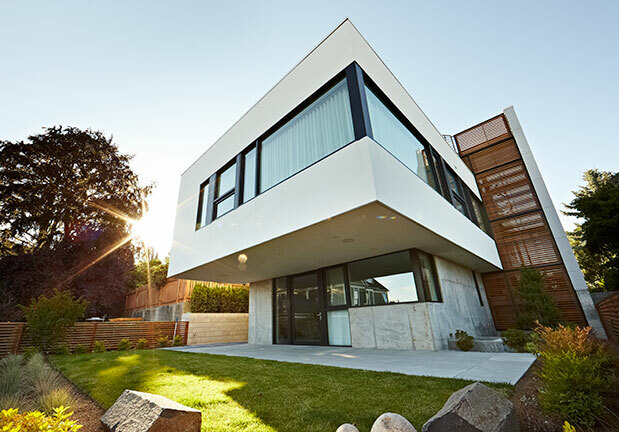 Hydronic radiant heating and high-velocity forced air, enhanced by geothermal wells drilled beneath the driveway, draw on the earth’s more stable underground temperature to heat and cool the house. Walnut wood repeats throughout the top story, covering the home’s kitchen cabinets and island. 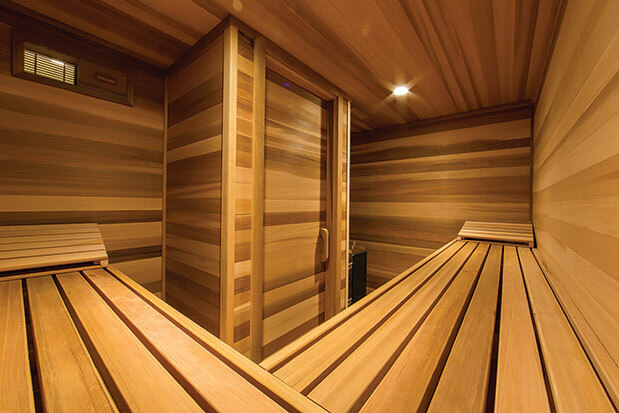 A private sauna, constructed of clear cedar, is located in the home’s basement level. 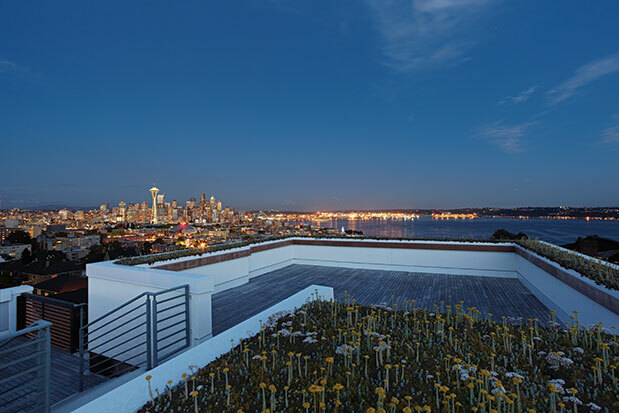 Other resource-efficient ideas found their way into the design, including a 5,000-gallon rainwater-harvesting system buried beneath the backyard and wiring on the roof deck for a future system of solar panels. Horizontal glass tile and frosted windows maximize natural light in the master bathroom. Railing height walls and glass windows flush against the ceiling give the master bedroom privacy from hillside neighbors without sacrificing views. 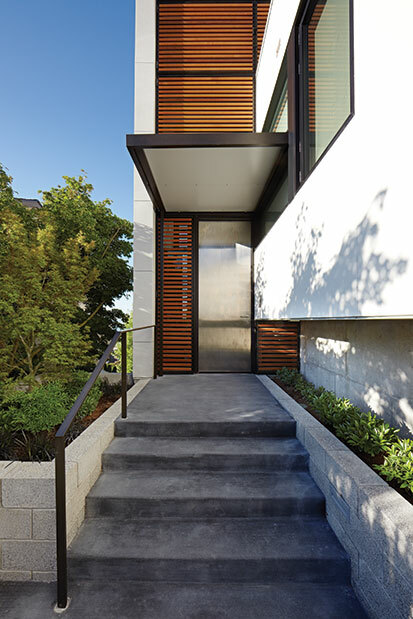 Blackened concrete pavers lead up to the house’s stainless steel front door, surrounded by cedar siding screens. defying design. “We had to push the boundaries a little bit,” Haizlip says.